As the first Black woman to grace the pages of French Vogue in the August 1988 issue Naomi Campbell has continued to redefine what it means to be a Supermodel. The London born beauty with Jamican roots splashed on the model scene at an early age Naomi has been breaking barriers her entire career. 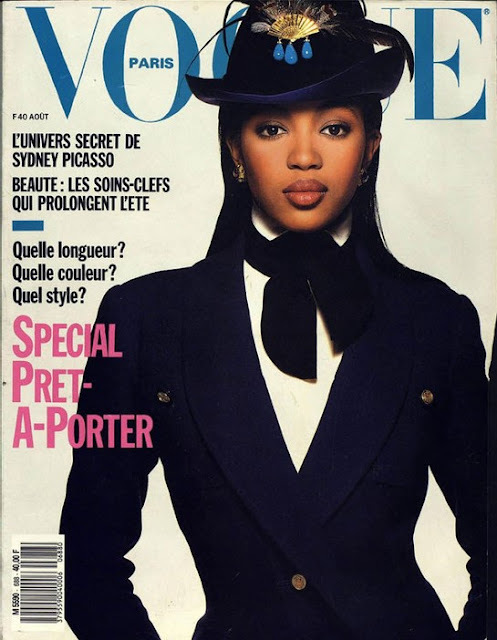 like being the first Black cover girl for British Vogue, in the December 1987 issue, since 1966. Appearing such fashion shows for Alexander McQueen and the Victoria Secret Fashion Show, Noami ushered in the era of the "Supermodel". Not only is she making history on the runway her charitable organizations Fashion Relief and We Love Brazil have raised millions for causes around the world. She also actively speaks out again the discrimination faced by Black models saying once,"I won't stop talking about diversity until I see improvement." She along with model Bethan Hardison and Iman created the "Diversity Coalition" and they wrote to designers of the industry imploring them include women of color in their shows. Creating new lanes for Black Supermodels, her charitable efforts, and her activism to include other women of color has made Naomi Campbell a one of a kind Icon of our generation.